So my first recipe of 2014 is going to be of my favourite ingredient – Chicken! 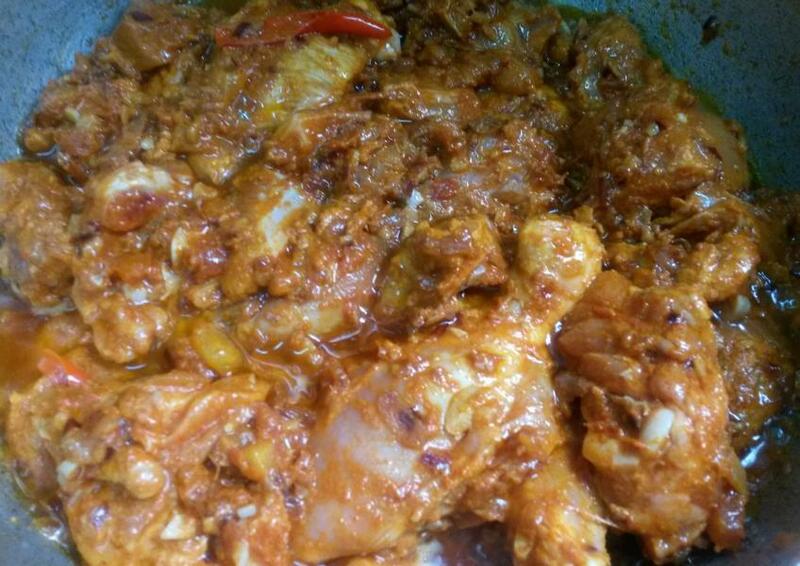 I have mentioned earlier that I am a big fan of poultry and love to try different variations with chicken. Everytime I taste some chicken dish I like, I try to get the recipe from the person who made it, or try to recreate it myself and luckily a couple of attempts yield successful results. 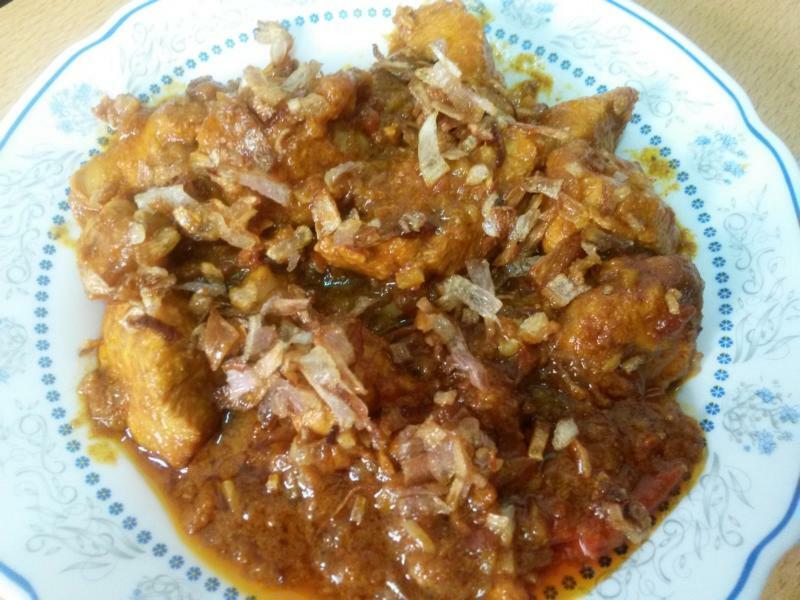 This chicken recipe was given to me by a friend in Kuwait. It is simple and very easy to make in 4 steps. It is one of those home-made dishes that don’t really have a name. 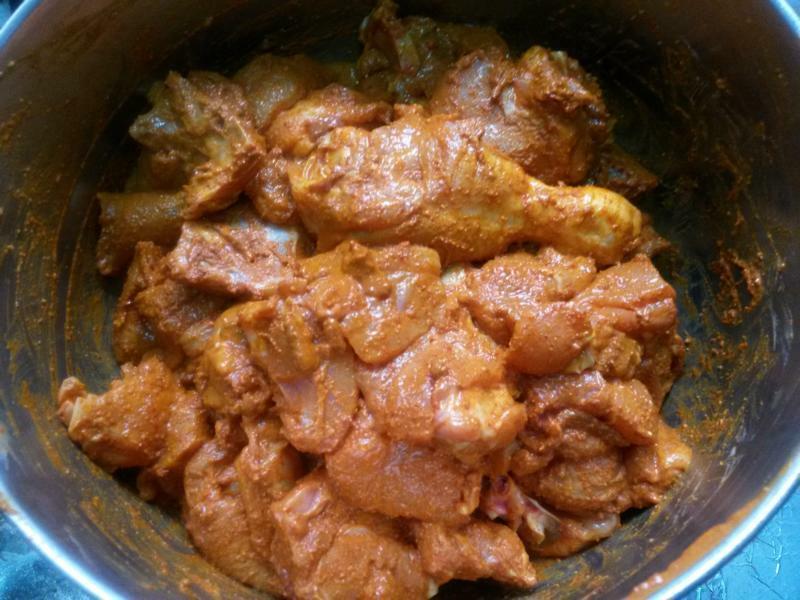 Since it is red in colour and since I am from Kerala and I use coconut oil in it, I called it Malabari Red Chicken!! The chicken is to be marinated in aromatic roasted spices and thick yoghurt. Marination always makes chicken succulent and more flavorful as the chicken absorbs the spices. Deep fry chopped onions in coconut oil until golden brown (other vegetable oil can also be used). Save some for garnishing. 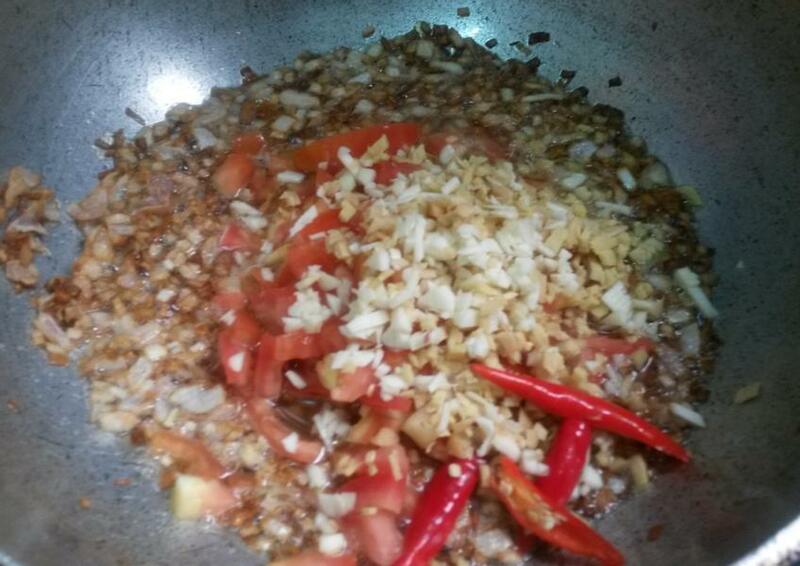 To the onions in the pan, add finely chopped ginger, garlic, fresh green or red chillis and tomatoes. Fry well till the tomatoes are softened, mashed and the oil starts to separate. Finally add the marinated chicken mix well and cook with closed lid on medium flame till done. Garnish with remaining fried crispy onions. First dry roast the chilli powder, turmeric and coriander powder till the raw smell goes. Be careful to not burn the spices. Marinate the chicken with these spice powders and the yoghurt. Keep aside for a while. 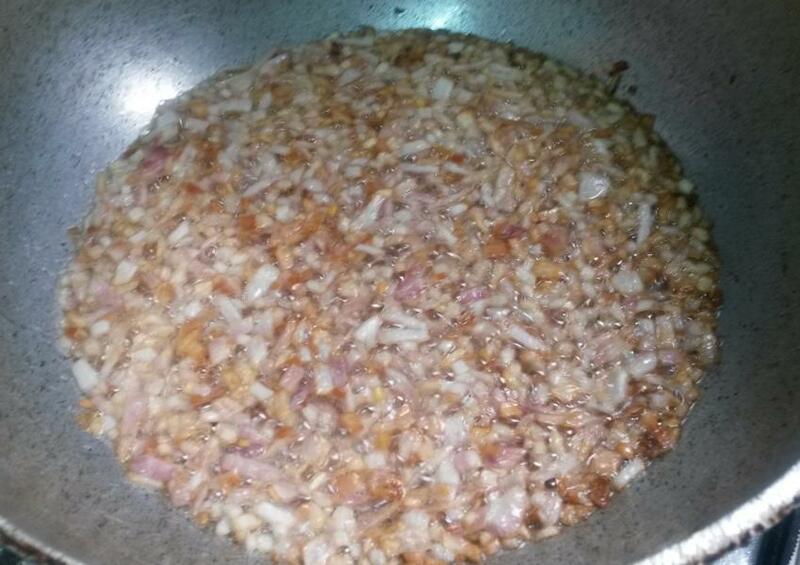 Heat the coconut oil in a pan and fry the onions till golden brown. Keep aside half the fried onions. 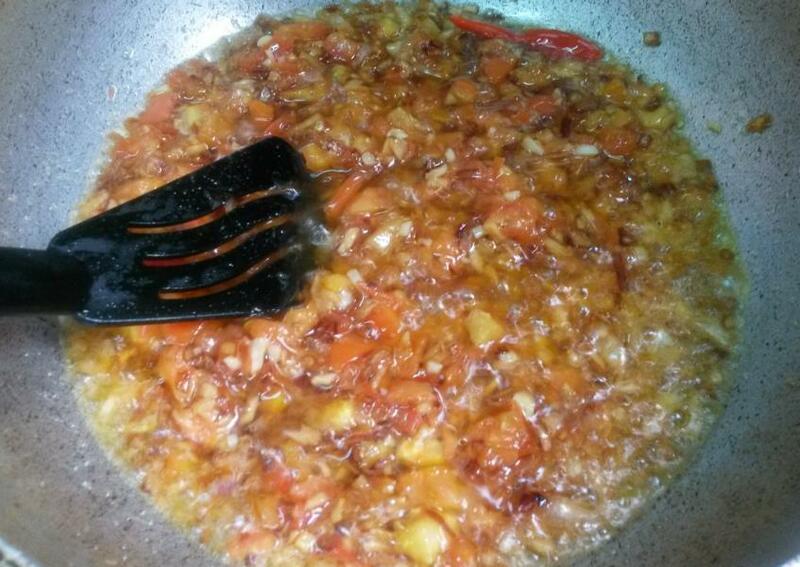 In the pan containing the remaining onions, add the ginger garlic, chilli and tomato and fry well till the tomatoes have become like a paste. Then add the chicken and mix well. Cook on closed lid till done. Happy New Year. I love this chicken recipe. It sounds so delicious. I have to make it this week. Will give you a feedback. Thanks for sharing!